The Camino dos Faros or Lighthouse Way is a superb coastal walking trail, taking in the wild and rugged beauty of the Costa da Morte, in the Atlantic coast of Galicia. Spectacular ocean views, pristine sandy beaches, impressive cliffs and a rich cultural and archaeological heritage await walkers on this trail that takes its name from the many lighthouses scattered in capes and headlands across the region. The ocean has been the main livelihood in the area for centuries, and fish and seafood fans will be in food heaven. Staying in quaint fishing villages, you will get the chance to sample the freshest treats from the sea. Ponteceso, for instance, is famous for its gooseneck barnacles (percebes), harvested from exposed sea cliffs by intrepid ‘percebeiros’. This breath taking coastal route is marked with green arrows by a local association, as this is not a Camino de Santiago trail. However, the green arrows will take you all the way to Cape Fisterra, the very end of the Camino and the end of the world! You should request your Muxiana (in Muxia) and Finisterrana (in Fisterra) certificates along the way, in the local tourist office. Your trip on the superb coastal Lighthouse Way, the Camino dos Faros, starts in the small town of Ponteceso; home to some of the best shellfish and seafood in the region. The town, and the Costa da Morte area in general, is famous for its gooseneck barnacles (percebe), a delicacy in Galicia, harvested from sea cliffs by intrepid local ‘percebeiros’. By the iconic Ponteceso bridge, you will see the home place of 19th century Galician poet Eduardo Pondal, author of the poem featuring in the Galician national anthem: Os Pinos (the pine trees). Your first day walking the Lighthouse Way takes you from Ponteceso to the fishing village of Laxe. From Ponteceso you will be walking in the pine forest of Ensenada da Insua to Urixeira Beach. The trail will follow the estuary and then continue inland for a few kilometres, taking walkers towards Cabana and some of the most important archaeological sites in the region and Galicia: Castro A Cibda (an ancient village dating back to the 6th century BC) and Dombate dolmen, an impressive megalithic tomb dating back to the 3rd century BC. On your way to Laxe and before descending towards the Praia de area das vacas beach, you will enjoy fantastic panoramic views of the Bay of Corme and Laxe. Your second walking day on the Lighthouse Way, the Camino dos Faros, continues from the fishing village of Laxe with its quaint cobbled lanes, pretty harbour and fantastic sandy beach. 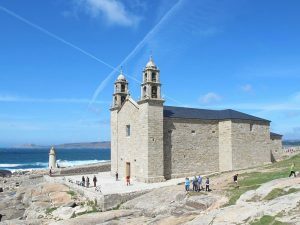 From the church of Santa Maria de Atalaya, walkers head for Laxe Lighthouse where you will enjoy superb panoramic views of the bay: the Ría de Corme e Laxe. You will be passing five different beaches on today’s walk so make sure you bring your swimming gear. In the village of Camelle, you will find the unique Museo de Man, an open-air museum created by German artist Manfred Gnädinger, who moved to the area in the 1960s. Today’s stretch of the Lighthouse Way, the Camino dos Faros is one of the most spectacular, wildly beautiful and full of history. The rugged coastline between Arou and Cabo Vilán (Cape Vilan) lighthouse, has been witness to many shipwrecks, one of the most famous being that of the Serpent, an English Navy boat that sank in the 19th century. From the top of the dune of Monte Blanco (white mountain) you will be able to appreciate the spectacular beauty of the region but also the power of the Atlantic Ocean. Praia de Trece beach, the Punta Boi headland, the English Cemetery, resting place for the victims of the Serpent; and Cabo Vilán lighthouse and surrounding cliffs make your walking route for today a very interesting trail. The area is also an Special Protection Area for Birds (SPA). Your destination is Camariñas fishing harbour. The Lighthouse Way takes walkers today from the fishing village of Camariñas all the way to Muxía harbour. Camariñas harbour is home to delicious fresh seafood and fish and also famous for its local bobbin lace (encaixe de bolillos), crafted at incredible speed by seasoned ‘palilleiras’ (lace making ladies). 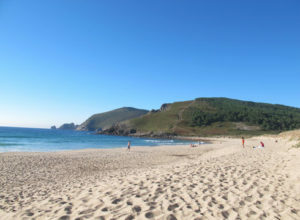 Today the Camino dos Faros trail takes you to a whopping 11 beaches! so don’t forget your swimming gear. You will be also passing quiet rural hamlets, forests and a route featuring lovingly restored traditional watermills. 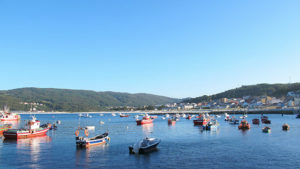 Your destination is the village of Muxía with its pretty harbour and Virxe da Barca cemetery, marking the final point of the Camino de Fisterra. You should be able to receive your Muxiana certificate from the local tourist office. Today’s walking section from the village of Muxía and its sanctuary to Lires, has more magnificent coastal views in store. There are a couple of climbs, to Monte Cachelmo, Punta Buitra and Monte Pedrouzo, but the panoramic views will be your reward. There are many beautiful sandy beaches also on this stretch of the Lighthouse Way, as well as more lighthouses (hence the name), including Faro Touriñán. After Nemiña beach, where you can enjoy a refreshing swim or walk on the strand, the Camino dos Faros takes you to the hamlet of Lires, your stop for the night. Today is your last day walking the superb Lighthouse Way, the Camino dos Faros, in the heart of the rugged Costa da Morte region. Your destination is Cape Fisterra and its iconic lighthouse. On a sunny summer day, you could enjoy a morning swim in Lires beach (3kms from the village), to get a fresh start for your trek. Today’s trail has in store fantastic Atlantic cliffs, such as Punta Besugueira, Mexadoira, Punta do Rostro and Punta do Castelo; and a couple of climbs that will reward your effort with fantastic views. 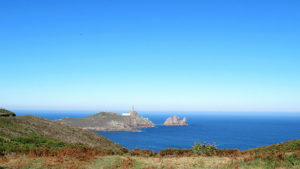 Cape Fisterra is your destination and final stop of the Camino dos Faros. 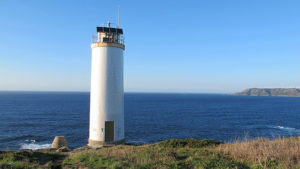 Cape Fisterra is home to possibly the most iconic of all the lighthouse of the Lighthouse Way, the Camino dos Faros. It is here where the KM0 of the Camino de Santiago is located and many pilgrims head here from Santiago to complete their Camino journey. Following the Lighthouse Way walking trail you will be approaching and seeing Fisterra from a different perspective. Talk to the CaminoWays.com travel specialists if you’d like to book additional nights in the village or back in Santiago de Compostela, before you head back home. You should request your Finisterrana certificate from the local tourist office. Aucasa has a direct bus connecting Santiago and Ponteceso but it is not very regular, for schedule see: www.aucasabus.com/buscador. 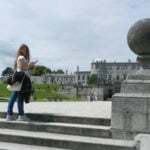 You can also take a bus to the closest biggest town: Carballo (23kms away) with regular buses from the cities of Santiago and A Coruña. From Carballo you can then take a taxi to Ponteceso. The CaminoWays.com can arrange a private transfer, let us know if you require one. There are various bus companies operating from Fisterra and Muxía with a few departures per day (only 2 per day from Muxía). 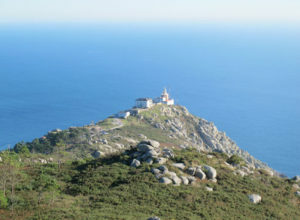 The journey from Fisterra takes approximately 2h30, and 2h from Muxía. For details see: www.monbus.es and www.autocaresvazquez.net for Fisterra; and Buses Ferrin for Muxía. Please note bus timetables vary at the weekends. Santiago de Compostela Airport 80km: Once in Santiago, you can take a shuttle bus from Santiago bus station to the airport, departing every 30min. Bus stops are bus station (Estación de Autobuses), train station (Estación de Ferrocarril) and city centre (Plaza de Galicia). See www.empresafreire.com. 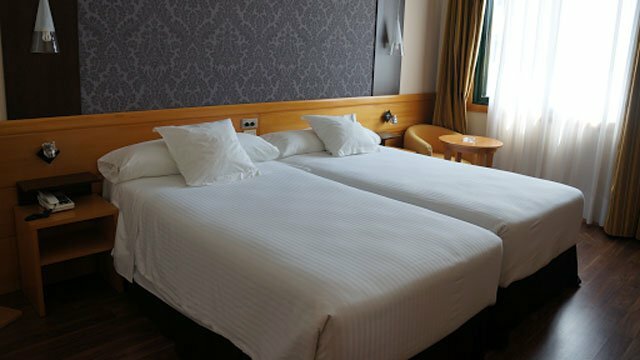 Vigo Airport 150km: Follow instructions to Santiago and from Santiago you can take either a bus to Travesia de Vigo or train to Vigo Guixar station, then take a bus to the airport from Travesia de Vigo (near Vigo Guixar station). Porto Airport 260km: From Santiago bus station you can take a bus to Porto airport once or twice a day (taking 4h or 6h resp.). See www.alsa.es.